Agape is the finest Liquid Multivitamin/Mineral in the World. Agape contains 25 Vitamins and Minerals including methylated folic acid. Agape is formulated to ensure unmatched bioavailability and maximum absorption. plastic and also provides UV protection. Agape is a Pleasant tasting liquid multivitamin designed for even the most sensitive individuals. 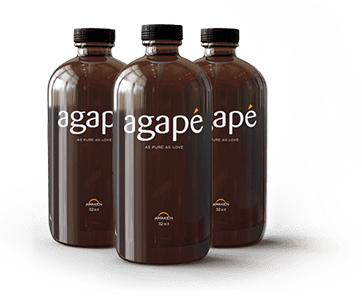 Agape is free of gluten, dairy, corn, soy, food dyes, and artificial sweeteners. Agape is sold only in glass bottles. Sweetened with Stevia and formulated to meet the maximum nutritional needs of even our most sensitive clients. Arrived fast, great product, no more brain fog, highly recommend for hair, skin, nails, concentration and brain fog! Amazing multi vitamin that's worth every cent. I have receommended to all my friends. Thank you! !